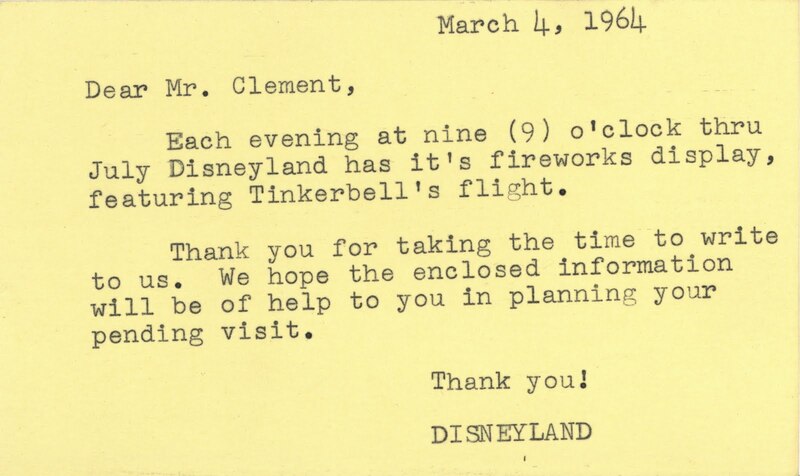 This little index card from March 4, 1964 appears to be in response to a guest question about the times and dates for the fireworks. 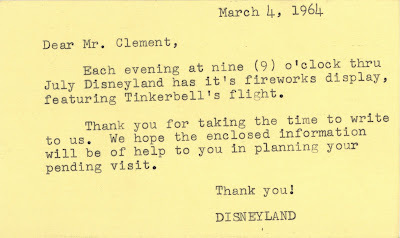 It's pretty amazing that Disneyland replied on blank index cards! From what I hear now-a-days Disney rarely responds to questions, but when they do I'm thinking they no longer use blank index cards? Wow, this small item is pretty remarkable... the fact that the Disney staff would take the time to personally answer such a casual question says volumes. As a child in the seventies, I wrote several letters asking questions about the park and always received a response back. The response was always on the stationary with the shiny gold embossed castle. Sometimes they would include publicity photos, other times they'd send the latest issue of Disney News Magazine or the Walt Disney Productions Annual Report, and a couple times they actually sent me the Disneyland Pictorial Souvenir book that was sold in the park! Those letters are yet another item that has been on my list of "things to post" in the future. I need to dig those out. Nice collection of vintage Disney Tickets. Now with everything done on the internet, the printed versions will be history except the printed passes issued at the gates.